KOKOMO, Ind. — Andrea Vaughn's family has prodded her for years to finish the college degree she started in 1998. Andrea VaughnVaughn stopped one class short of her degree in 2009, fearing the public speaking class she needed to take. In December, Vaughn, from Anderson, will finally earn the degree, thanks to a scholarship aimed at students like her, who left school just a few credits short of graduation. "I will be glad to have my degree," she said. "Now my family can quit asking me when I'm going to finish it. If I knew back when I was younger what I know now, I would not have gone this route." Vaughn was the first student to accept a $500 scholarship from the "Complete IU Kokomo" program, available to former IU students from any campus who had at least 90 credits and a 3.0 grade point average before leaving school. Candy Thompson, director of general studies and distance education, said those eligible are good students who had to stop work on their degree for a variety of reasons. "They're all so close to graduation, and they're all good students," Thompson said. "These are the students you want to come back to campus. They've come such a long way, we want to encourage them to complete their degrees." She hopes to have more returning students enrolled for the spring semester. Thompson reviewed five years of records to identify potential returning students, and prepared individual letters and potential class schedules, nearly always classes offered in the evening, through the accelerated program, or online. These often appeal more to older students than the idea of coming back to campus. "Some of them could finish a degree in one semester," she said. "I think if I hadn't finished, and was so close, the scholarship incentive would be very tempting." 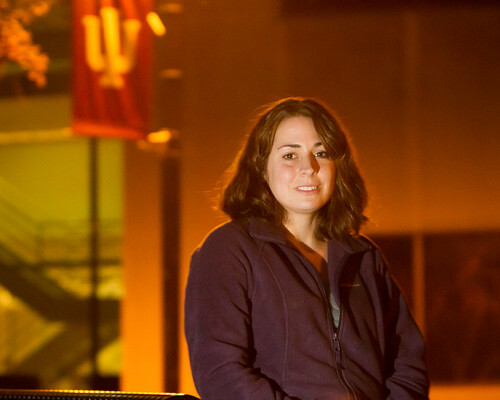 Vaughn said the scholarship gave her the push she needed to finish her degree, which she started at IUPUI. "I thought, 'Well, I have no choice. It would be really stupid to turn this down. One class, $500 towards the tuition, I would be ridiculous not to do it.' It was too good a deal," Vaughn said. She chose an eight-week professional communications class that meets one evening per week. She home schools her children, ages 5 and 2, so an evening class fits in her schedule, she said. "Speaking in front of the class is still hard, but I have my eye on the prize," she said. Every class is one step closer to graduating." The program is funded with a $30,000 grant from Complete College America, a national nonprofit organization that works with states to increase college completion. According to the Lumina Foundation, Indiana ranks 40th in the country in college degree attainment. The campus is also using the grant funding for degree mapping programs and three-year degree programs in education and business. Indiana University Kokomo serves north central Indiana.